Do you ever get stuck in a rut of wanting to print your pictures but you just don't know where to start so nothing ever gets printed? Its so hard to decide which pieces to invest in, and how. I always help my clients through this process, but for anyone who has purchased their digital images and is printing on their own, this should help! My favorite options for large wall art are canvas, metal, and framed prints. Framed pieces have a special place in my heart as I think they are classically beautiful. Clients tend to choose frames according to their colors and decor in each room, so they don't necessarily need as much help with those. For that reason, we'll discuss canvas and metal today. Canvases get a bad wrap (see what I did there?!) because most people are purchasing them with the latest Groupon or BOGO sale. Not only do these products not hold up, but they won't make it through generations as an heirloom item. BUT - when a canvas is printed through a professional, trusted printing lab, the finished product is gorgeous. I love that canvases are totally versatile. You can hang a canvas in your grandmother's house or your newborn's nursery, your living room or your bathroom, the office or the playroom. They fit in a soft, farmhouse styled home or a minimalist, modern, industrial home. They look great in black and white or color. You can hang them alone or in a cluster. 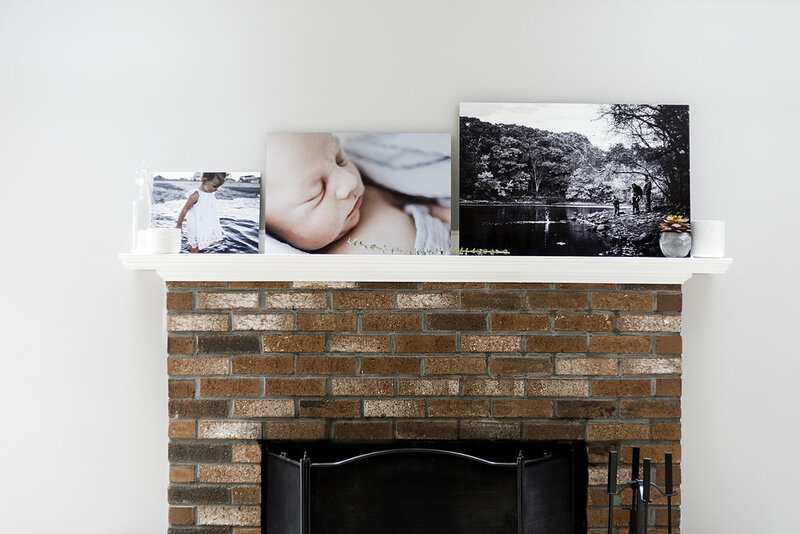 The canvases I carry are so easy to hang, so you'll have no excuse for purchasing it and then letting it sit in the room until you get around to putting it up! I print them with a color border, or the image wrapped around the edges; depending on which image I'm printing. The detail on my canvas prints is beautiful! Just the right amount of gloss and lustre. A canvas is my definite go-to when I know I want to print big! Metal prints are so delicious! Yup, delicious. The sharp, crisp lines and vivid colors are incomparable. And can we talk about that stunning contrast in the black and white metals? My metals come in two options: high gloss metal base and a high gloss white base. The metal base allows the metal tones to shine through and the image is almost translucent on the metal. Its a really cool look. The white base allows the bright whites to shine and it shows true colors because it is printed onto a white base. This is my personal favorite. My metal prints come ready to hang with a 3/4 inch block, which also gives it a unique floating look on your walls. 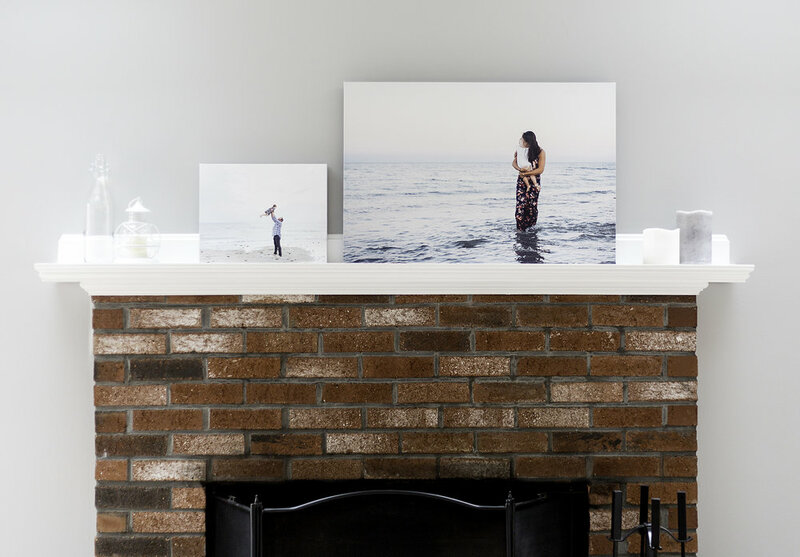 Metal prints are their own gorgeous style. I think they can fit beautifully in the right spaces. I hang these pieces anywhere in homes that have a more modern feel to them. In more traditional homes, I like to use them as a statement piece. A huge one above the fireplace, or behind the dining room table, or even a single piece on a blank wall in a bathroom, can be really impactful. I love gifting metals because its not something many people will purchase for themselves so it gives them something new and fun! These make really cool Christmas presents. When it comes to deciding which size to order, my #1 rule is, always go bigger than you think. In our heads, an 11x14 sounds like a good size for a wall print. Look at the product on the left in the two images below. Thats an 11x14! Imagine hanging that above your fireplace or behind your living room sofa? Even the 20x30 doesn't look big enough for above the fireplace. Seeing real life sizes comparisons is so helpful. I bring samples to my ordering sessions with clients so that we can hold them up onto the wall space that they are ordering for and see which size is the perfect fit. Its really mind blowing when you put a piece up and it looks tiny. I also use an incredible software which places an image from your photo session onto the wall of a picture of your actual room, and we can expand the size together on the screen and decide which to purchase. Isn't technology something? For those of you ordering wall art on your own, this image should help! I hope this was informative and can help lead you in the right direction! I'm always here if you have any questions. Feel free to email me! Interested in a session with Kristen Anastacia Photography?